IRNA – Iran’s envoy to the United Nations called on the Organization of Islamic Conference (OIC) to take practical measures to stop the crimes of the Zionist regime of Israel against Palestinians. 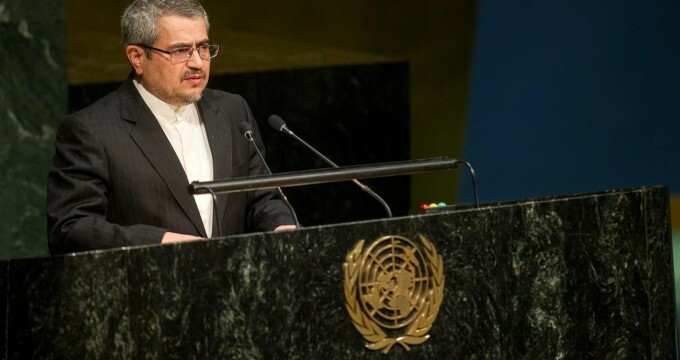 In a meeting held upon a request by Turkey’s Permanent Mission to the UN to discuss the latest developments in Palestine, Iran’s Ambassador to the UN, Gholamali Khoshroo, called on OIC to express the Muslim world’s call for practical measures to pressure the Zionist regime. The speech was delivered at an ambassadorial level meeting of the OIC at the UN on the threshold of an extraordinary session of the organization on Palestine in Istanbul. After 7 decades and due to negligence and silence of international community, Israeli regime’s brutal policies and practices toward Palestinian people continue to violate the fundamental human rights and dignity of the Palestinian people and other Arabs living under its occupation. Meanwhile, this week, which mark 70 years since the tragic Nakba of the Palestinian people in 1948, the military aggression against peaceful protesters of Palestinian civilian in Gaza, have led to yet another massacre by Israeli regime. While strongly condemning the continued crimes and atrocities committed by the Israeli regime against the innocent Palestinians, The Islamic Republic of Iran, reaffirms its abiding solidarity with the brave Palestinian people and its unwavering support for their legitimate struggle for freedom and independence and the establishment of a sovereign Palestinian state with Al-Quds as its capital. We firmly condemn the US decision on Al-Quds, on 6th December, 2017, and reject its entire consequence, including recent USA action in moving its embassy to Al-Quds. This action represents grave violation of international laws and UN resolutions. It is a clearly illegal and immoral aggression over the rights of the Palestinian people and a highly provocative action that pushes the region into further violence and conflict. The Government of the United States should absolutely be accountable for the consequences of its illegal decisions, specially its unconditional support for the Israeli regime and the total impunity it extends to this regime in committing crimes against the Palestinian People and the region. Israeli regime continues to massacre countless Palestinians as they protest, Since March 30 this year, the Israelis have killed 111 Palestinian and wounded around 10.000 in Gaza, only on Monday 14 May 2018 more than 60 Palestinian have been martyred and more than 2500 injured. At the same time the Israeli army was making its latest bloodbath in Gaza, Netanyahu and his guests were busy celebrating illegal move of US embassy to Jerusalem. A day of great shame for the Islamic world. The Organization of Islamic Cooperation, should echo the voice and aspirations of the Islamic Ummah, it has a great responsibility and is expected to take efficient and practical measures to force the Israeli regime to cease its brutalities against the defenseless people of Palestine, and most urgently ending the suffering of the people of Gaza. In this regard, we call on the OIC Member States to mobilize their joint efforts and take appropriate measures in support of the Palestinian cause, as the cornerstone and raison d’etre of OIC. Any attempt by some member States for recognition and normalization of relations with the Israeli regime is tantamount to betray our Palestinian brothers and sisters, emboldens Israeli regime to entrench its occupations and divide the Islamic Ummah in the troubled circumstances in the Middle East. In conclusion, I would like to once again reiterate my country’s unwavering commitment to a just and comprehensive solution to the question of Palestine, end of occupation and the full and immediate restoration of the inalienable rights of the Palestinian people.